Everyone is a photographer these days, with iPhones or other devices constantly at the ready, and anxious to capture every photogenic moment or significant event—from daily selfies to pivotal moments in the lives of family and friends. Nothing is sacred amid this picture-taking frenzy, not even the complex orchestrations of a wedding day. So, what can a professional wedding photographer do to stem the tide of snap-happy wedding guests, oblivious to the fact that they are homing in on your territory? We asked seven pros for some strategies that offer them the best results. 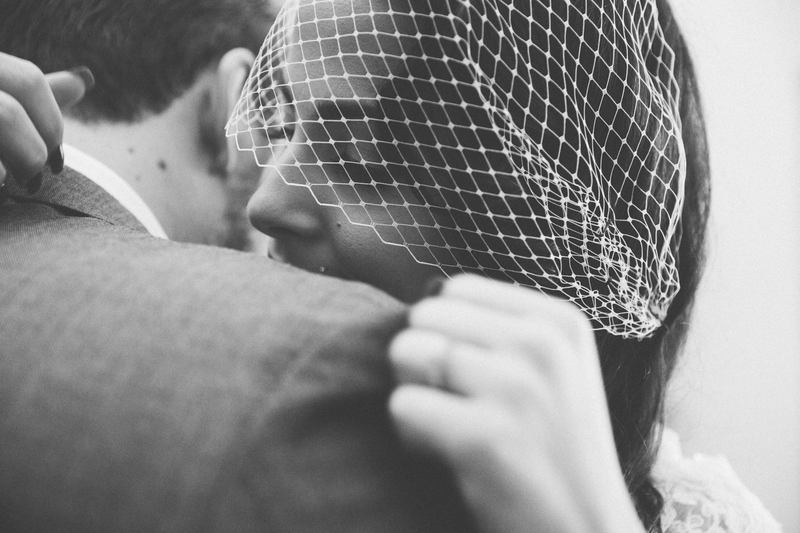 “An unplugged wedding!” exclaims New York City-based wedding photographer Paige Denkin. “It’s a thing and I highly recommend it.” Denkin, who is preparing for her own wedding this fall, notes that this is a question her own wedding planner recently brought up. A business strategy Denkin has adopted to protect herself and her work methods is to include a clause in her wedding contracts to specify that no other professional flash photography is allowed. 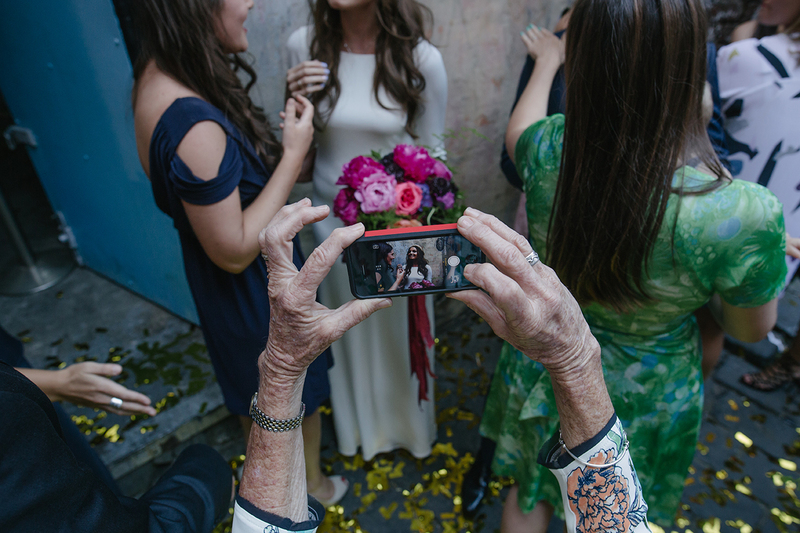 “Many photographers are not keen on the idea of other people with cameras at weddings, and for good reason—they can potentially interfere with your best photo or an important part of the day,” says Australian wedding photographer Jai Long. 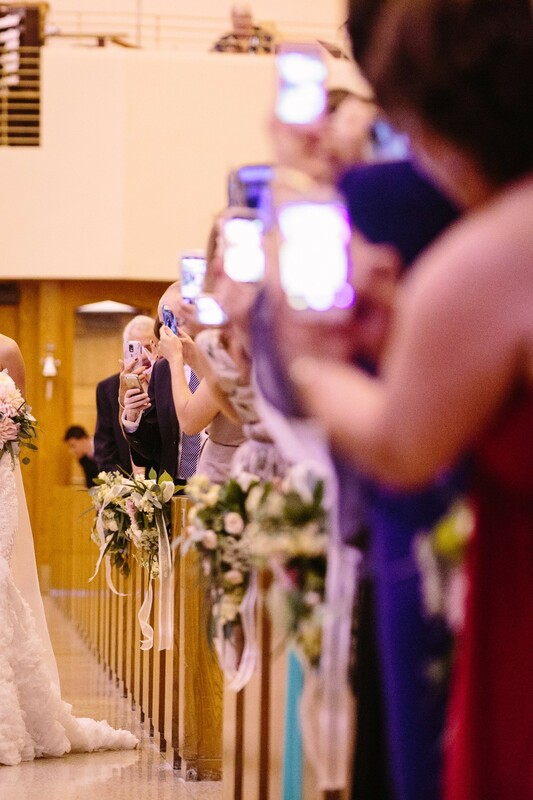 However, Long takes a philosophical view over the concern about wedding guests taking pictures, saying, “Personally, I have no problem with friends and family bringing their cameras to the weddings I shoot. If the couple doesn’t mind having an uncle taking photos on the DSLR he just bought, then I don’t mind either. It is their wedding, and their friends and family, so I will work around everyone to make sure I get the best possible photos. She suggests that if the bride and groom have a family member or guest who is a known photographer and likely to bring a DSLR and an off-camera flash, the couple should have a chat with them way in advance of the wedding date, asking them to refrain from shooting so they can enjoy the wedding as a guest, and assuring them that a great team have been hired to photograph the event. After telling individual guests that they are welcome to take photos, she reinforces that they must remain in their seats during the ceremony. “We also remind them that they can’t stick their phones in the aisle,” she says. According to Von Bruening, these guests often speak to her about their intention to photograph. “A polite approach, such as asking them to wait until you get your images, usually does the trick,” she says. Leahy, whose general shooting style is fun, light, and fast-paced, is totally comfortable telling a disruptive guest that they can have a turn once he is finished. “I always say it with a smile, and often a joke that their little camera probably takes way better photos than mine anyways,” he explains. 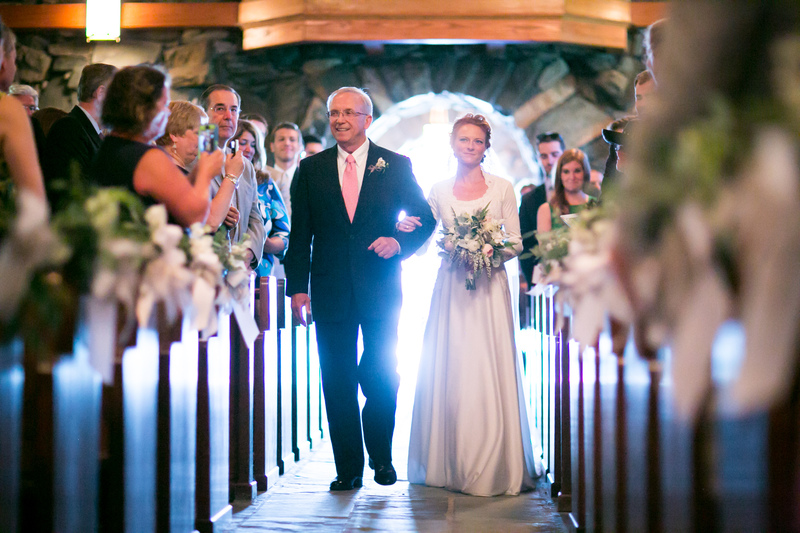 “Our clients hire us to get images no one else at that wedding can take, so it’s our job to be flexible and anticipate when a particular guest may be an issue,” Leahy adds. According to Leahy, if he finds a guest to be particularly disruptive, “I make few quick shots as if that person wasn’t there. I’ll also get different angles and viewpoints without them in the picture,” he says, finding it beneficial to have examples to show the couple if questions arise after the fact. Morse has weathered all manner of roadblocks. “In some churches, the priest will say, ‘Sorry you have to shoot from the balcony,’ but Aunt Jane can be in the front row with her digital SLR and shoot all the pictures she wants—and that’s OK,” he opines. Not only does this immediately validate your photography and your best efforts, “it also gets ahead of everyone’s iPhone pictures, where the lighting is off and the couple doesn’t look good at all. Almost immediately, the bride and groom get to put my picture up on social media instead of Uncle Bob’s,” he says. To learn more about the contributors to this article, click on their names below. Imagine if we let the guests be the photogrpaher- the angles, the views, the variety. Lets have a PLUGGED in wedding- everyone use #coupleslastnamescombinedinacatchywaypluggedin share your goods and someone combine them all for the couple. I am guessing the photographers (all of them! )will still enjoy the wedding and if a pro photog and videog are hired, well we have that much more to share the day. The pics I took, I can keep and share from my phone a seccond after I shoot them, no wating to try to see the pro pics. Everyone is indeed a photographer and theyre getting better and better at it as the phone cameras improve. I think its wicked cool and there is no slowing it down. Announce and restrict your guests all you want but I think they would appreciate you inviting them into the game more. Thanks so much for your comment Red, you definitely have a good point here, however I think much of this decision would hinge on whether the wedding is highly structured and formal or goes a more casual route. If the wedding couple is planning something extremely formal, I think it would be totally appropriate to request that guests refrain from photography, especially during the more structured portions of the event. But if it has a more casual feel, then a plugged-in wedding would make things all the more fun...the more, the merrier! Happy shooting and thanks for reading the Explora blog! I have a bit of a different take on this. I have a bit of a photography business, but have been a wedding DJ for years. I got interested in shooting weddings because of DJing so many. I have always respected the hired photographers and have learned a lot from them through my conversations with them. I never shoot pictures while the photographer is posing anyone. I love to capture the things most people are not looking at. Only one time was I told to NOT take photos. There is only one photographer that has ever said anything to the Bride and Groom about me shooting. Later I was told that photographer didn't really like wedding photography so.. I HAVE shot weddings and there have been people there with DSLRs taking photos both when I was posing people and not. I don't think it will be stopped now with the lowering of prices of technology. I guess as photographers we have to work harder and make things better and try to make images to amazing the uncle can't compete? Thanks so much for your perspective on this subject, Rick. As a wedding DJ, I'm sure you have a very different take on these events that informs the pictures you make. I really appreciate the idea that you love capturing the things most people are not looking at. Since you have a rather unique view of the action and privileged access to the musical component, I'd imagine that you could pitch a certain level of image-making coverage to potential wedding clients as a value-added part of your DJ services. This would give you a chance to clarify in advance that you are not looking to compete with vendors hired specifically to document the event in pictures. As you say, given the rapid evolution of technology today, photographers have to work harder and make things better to differentiate themselves from the pack. Here's wishing you continued success in your efforts, and thanks again for reading the Explora blog! I fully agree with the photographers in the article that suggest the "unplugged" weddings. September 2015, I was married and our wedding ceremony was "unplugged". This allowed our guests to enjoy our ceremony and be connected with us. 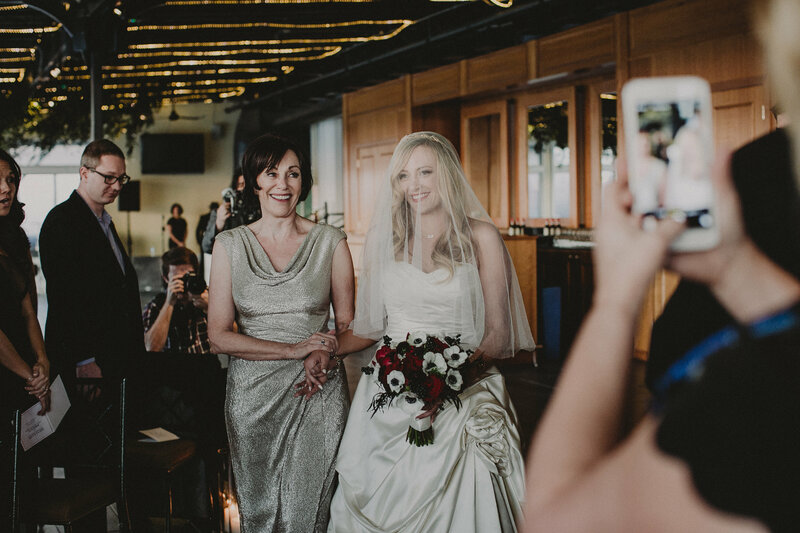 In return, we recieved amazing photos from our photographer that showcased the happiness in the faces of our guests and she was able to capture the precious moments of the ceremony with no problems (cameras, cellphones, ipads in faces or down the isle). I had the pleasure (stress!) of photographing my niece's late evening wedding this weekend and she did not request for an "unplugged" wedding. Her step-father stood next to the wedding arch with his 10 inch Ipad the whole ceremony, right between the best man and groom's shoulder. There is no way to get him out of the photo and there was no way to take a photo that excluded him and I refuse to walk up to disturb the ceremony to tap him on the shoulder to ask him to move. It's sad because not only does it look very tacky but it's there to stay! Not to mention the arms with cellphones hanging in the isle as my brother walked his daughter down the isle. Also there were so many people gathered around to take photos of the couple while I was arranging the group shots that I couldn't move without bumping in to someone! Photos that should have only taken 30 minutes turned into 3 hours (we had to dodge rain quite a few times) and a lot of the shots were ruined because of another person's flash going off at the same time. I've ammended my photography contract in hopes that this will never occur again. It was the worst experience I've ever had doing wedding photography. 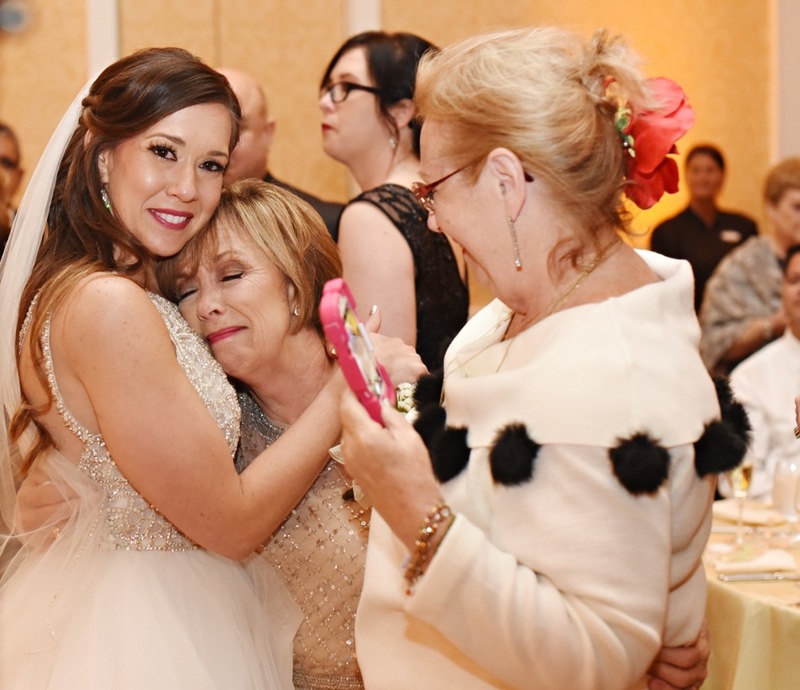 Hi Kim, thanks so much for sharing your recent unfortunate experience in photographing a wedding featuring a family member front and center with iPad. This definitely sounds stressful! Ammending your photography contract to avert such occurances in the future is definitely a step in the right direction but, beyond that, you should make sure to have a candid conversation with future clients to assess their feelings and, ideally, ask them to request that their guests be respectful when making pictures, especially during the ceremony. Here's wishing you better luck with future wedding shoots and thanks again for reading the blog! Thanks for the suggestion! I never in my life thought someone would be that up close and right in the middle of everything. I'd never do that as a guest but I guess someone could get wrapped up in wanting to be able to get everything themselves instead of letting the person that was hired to do their job. I don't know if he knew that I was the photographer or not, I think he may have just thought I was just a family member shooting photos...usually you can tell because I don't sit down at all, I'm too busy to! :) Also, great informative blog! Thanks for your compliment on the blog, Kim. About that wedding you shot, you bring up a good point about the possibility that you were perceived simply as a family member taking a lot of pictures rather than in your dual duty as family member and hired wedding photographer. As someone wtith lot of past experience in wearing two (or more) hats and bluring lines between personal and professional myself, I wouldn't doubt for a minute that other wedding guests did not realize you were actually wearing two hats at this event! If you ever find yourself in a similar situation again, I'd highly recommend that you specifically ask the wedding couple to formally introduce you as both a family member and the professional photographer they've engaged to document the event (as well as including this in the written program about the wedding party, if there is one). Once that point is clarfied, I'm certain that everyone will be moving out of your way and treating you with the utmost respect. Hope this is helpful and thanks again for reading the blog ... please visit again soon! Todays society is all about instant gratification and how quick something can be put on social media about the event. Any good photographer will take days or weeks to process the photo's... Most people don't want to wait that long to share in the excitement of the event. Hence the average Joe photographer with a cell phone. I agree that any good photographer can work around others with cell phones, dlsr, point and shoots or whatever they bring. As a photographer you also have to remember that you cannot be everywhere and catch every moment and with these other people shooting many many happy moments will be captured that might have been unnoticed by the Pro Photographer and isn't the point of having pictures taken is to document the event so why not allow others to help. For many wedding photographers Its all about the money and what they milk out of a wedding shoot. A couple we know got totally took by this kind of behavior in as much as they photographer made them sign a contract to not post the photo's to social media etc without paying him extra for that pic every time it was posted even though they had paid him for it already. Then he also was the only one who could print them, make copy's etc. Those ways of thinking need to be a thing of the past. I understood it with film but in the digital age we are in its no longer a necessity to go back to your photographer once you have received his files. If you hire a photographer it should be for there time and talent behind the lens, in the end you as the client should own everything. All digital negatives to do whatever you please with..
Greetings Steve, thanks for posting a comment and your opinions about the article. You bring up a number of very salient points. While I do agree about the huge potential wedding guest photographers can have in helping to capture the many happy moments that occur during the course of a wedding, the issue of ownership of all images shot by a given wedding photographer is quite another matter, which really needs to involve a thorough discussion of copyright. For the sake of clarity, this discussion should occur at the outset of a relationship to avoid any misunderstandings or awkward moments down the line. As a protection for both parties, a written agreement is a very useful way to confirm that everyone is on the same page in terms of image rights and assurances. 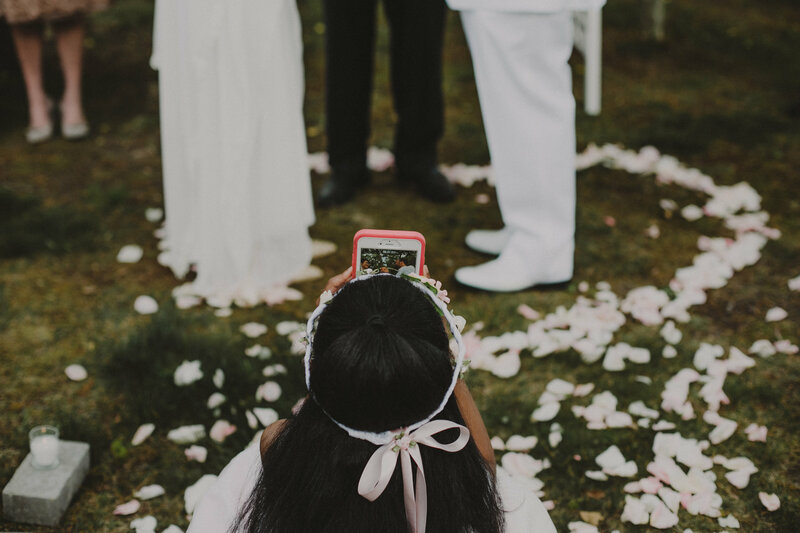 Professional photographers have widely ranging views and procedures about all of this, which is an even greater reason why it should be among the first things discussed by a couple seeking a photographer to document this occasion. The wedding couple should be in the position to choose whether to sign or decline any agreement they are presented, rather than being "made to" sign an agreement through coercion or other pressures. Thanks again for your comments and for reading the blog! Hi Russell, thanks so much for writing in and sharing your opinion on unplugged weddings. I'm actually glad to read your comment, as writing this article got me a bit stressed over whether I'll be viewed as a nuisance when making pictures during a destination wedding I'll be attending this summer! I definitely agree that a good photographer should be capable of working around the other devices in play, but I also think that sometimes guests need to become more aware of their footprint when photographing in certain situations and moments. I tried to approach this article from the perspective of educating readers about the various dynamics of making pictures in this type of setting as a means to building awareness. Common courtesy counts for a lot, especially in the midst of a joyous occasion. Thanks again for your comment and for reading Explora! The pretense that the real issue here is that an eager guest may cause you to botch some shots is a thinly veiled excuse for the real sentiment here: I might make less money if the bride and groom (or other combination thereof) have other picture options. It's not like the guests aren't contending with the same conditions you are. Other people are in their way too. Other people are ruining their lighting too. Any pro worth their salt should be confident that they will be the source with the quality shots. If you aren't, then you have failed and that's no one's fault but your own. This couple only gets their day once. If you bring your F game and they have no other photos, that's a catastrophic loss from which there is no recovery. I understand politely pointing out that guests are in frame. I understand keeping people back while working through the group photos. But unless someone is harassing you by following you around like a lost puppy, leave the guests to their own devices. If someone is getting better quality shots than you, that's your shortcoming. If they are in position and you're nowhere to be found, you dropped the ball. I mean, the truth hurts, but don't sit there and act like it's the couple's deepest desire that no one snap pictures just because you're insecure about your own abilities. Hi Joshua, thanks so much for your comments and insights. You bring up a curious point about the financial aspect of wedding guests in competing for picture opportunities. This is something that never came up during any of my conversations with the photographers interviewed for this story. Additionally, none of these photographers mentioned any insecurity in his or her abilities in relation to wedding guest images. While your points might serve as a fair warning to photographers who may be inexperienced with the wedding marketplace or lacking in confidence, as you say, “any pro worth their salt should be confident that they will be the source with the quality shots.” Thanks again for reading and writing in! Gone is the day of the true professional wedding photographer. It was changed by the film manufacturers and their digital cohorts. I live in a city with a photography college and everyone thinks they are a pro. When in reality they are just lucky. I have viewed the albums of my competition. The new albums look like high school year books in comparison to the old wedding albums. We professionals need to do something different using the new technology while locking our work up in a way that it cannot be copied as it has been done so much since the advent of the scanner. Any suggestions? Greetings Earl, and thanks for your comments. The way I see it, the act of copying has far less to do with the advent of the scanner than with creatives who lack passion or a vision for their work. As a generally accessible and democratic medium, photography is regularly subject to new converts, whose initial interest and/or early success is often fueled by luck. It is also a highly subjective practice, so that one person’s opinion of quality is not always shared across the board. My best suggestion to you is to follow your passions in making pictures and work to continually refine your vision (using new technology or whatever else makes sense) in order to keep fresh and differentiate yourself from others. I hope this is helpful to you, and thanks again for reading and writing in! I've been on both sides of the wedding photographer argument. As a serious amateur for over 60 years now, though my first real job was as a professional, I've shot many dozens of weddings in my day, with my Mamiya 330s and later my DSLRs and camcorders, shooting weddings mainly for friends and acquaintances. I always shoot together with an experienced friend as one cannot be in two places at a time and equipment and reloading can hinder desirable shots. As a rule we always use an off axis flash, with the Statue of Liberty pose, to avoid pink eye and flat lighting and especially to fill in shadow and give the eyes a sparkle when shooting outside. Having two on my team has paid off when the bride would contort her face when we were ready to shoot. I would step back with my telephoto to take the real shots while the bride was relaxed and Jim up close would just dump his flash. At weddings that I have been invited to as a guest, I usually brought one camera with telephoto lens and would fire off 2 to 3 shots during the entire day and then present the couple with 11 x 14s as a gift. It never ceased to amaze me the poor quality of most of the actual photographers hired by expensive prestige photography businesses. Rare indeed is the "professional" photographer who can manage fill-in flash outside. Inevitably it was my few shots that got hung on the couple's walls. On a couple of occasions the pros had total failures and re-shot a few weeks later as part of the contract, incurring tux rentals etc. and emotionless shots. My favorite shot is the group picture of all the guests typically on the church's front steps. I would supply a drawing outlining all the guests with their names inside their outlines. These 5 x 7s would be included in the couple's thank you notes. I have presented 16 x24s of these group pictures at 25th wedding anniversaries, which drew a crowd but resulted in a lot of crying as most of the people pictured had passed away. I do still present them at 25th anniversaries but request they not open the package until after. It is my feeling that only an insecure and inexperienced "professional" photographer would resent the amateurs. I would welcome them and help them along with hints. The big trick in a good wedding picture is the capturing of THE facial expression which only occurs for a split second. I get a real thrill when I see it develop and fire at the exact moment. I would practice when editing my wedding videos by hitting pause and evaluate how I did by examining the frames before and after. That's the art of shooting people. Hi John, what an interesting perspective you bring to this discussion. The point you made about studying the facial expressions when editing a wedding video as a way to practice capturing an optimal moment is a great tip. And these days, with 4K video, you can even export that framegrab and make a reasonable print of this fleeting moment for your subjects. Happy shooting, and thanks so much for reading Explora! During a recent engagement ceremony of one of my friend's daugher, the photograper did not show up for more than one hour. Fortunately I carried one of my best cameras and started shooting pictures of relevance right from the beginning. When he arrrived, he also started taking pictures. Soon he realized that I happen to attract the right kind of people who wanted to be in the picture. He started "muscling in" to the point of being outright rude and aggressive to get the same pictures I was taking. I was left with no choice to remind him that if he continued in the direction, I will be left with no choice but to ask him to leave as his presence became unnecessary. When the pictures were brought to my friend, it was obvious that this "professional photographer" was not truely a professional to the point my friend felt cheated out of money... Apart from this, many professional photograpers have no clue as to the sequence or imporatnce of certain proceedings in a wedding or an engagement ceremony. For example ceratin ethnic communities have certain ceremonies that are even more imporatnt than the wedding itself. Some of the people who are elders and close relatives of the bride or groom may not take part actively. Missing thse people in the pictures taken shows total lack of knowledge on the part of the photographer. The last time a "polite shout" as mentoned by Mr. Lehey eneded up with the in laws asking the photograper to leave politely as they had hired another company photograper who quietly and efficiently did his job winning praises when all was said and done. Yes, it is a nuisence and an intrusion from the guests. But it is an art how to get around this and get some of the best pictures ever taken. Sounds just like an Uncle Bob. Thanks for writing in usdoc1. I have to say that I agree with Kj's assessment of the situation you describe. While the photographer hired to document this event made a very big mistake in being late, your behavior in denying him access to the "relevent" picture opportunities once he arrived seems quite inhospitable and not in keeping with what I assume should have been a joyous occasion. While the photographer's tardiness is not beyond reproach, I can totally understand how the pictures he was able to make suffered given these circumstances - his late arrival combined with your aggressive attitude as the alpha imagemaker. It seems very clear that this photographer had a far weaker relationship with his client than your connection with this person as a friend. All of which points to one of the most essential elements for successful pictures: The relationship and trust between a photographer and his or her subject(s). Given that connection, I'm glad to hear that you got some good pictures of such a singular event. Thanks again for reading the blog! I'm not sure why you decided to remove my first critical comment... Feel free to delete this comment too, if you so choose, but I think you're overlooking the fact that the bride and groom, plus immediate family, have full authority to ask someone to stop taking pictures if they're really being some sort of burden. Who are you or Kj to assess the intentions or wishes of the bride and groom better than their friend and wedding attendee? I wasn't there, I don't know usdoc1, and I can't judge the situation based on his limited description alone, but assuming that all wedding photographers are created equally and adequately is unrealistic. I've seen too many people bitterly disappointed with the fact that they had put faith in the photographer's abilities. The bride and groom should be free to decide how they feel about the likelihood that the professional photographer will be enough. I wholeheartedly agree that if they decide that they don't want other people running around and trying to get pictures, they should express that and the guests should respect this decision. But framing it like the mere fact that a photographer was hired implies that they don't want guests giving it a go, that's a pretty biased stance to take. I am moderating the comment system today. Your previous comment was deleted, not for its opinion, but for your use of an abbreviation commonly used for a profane expression. You may certainly repost your comment, but please leave out any hint of profanity (including slang, acronyms, and abbreviations) and I am sure that the author will reply as she will reply to your new comment. Thank you for reading and writing into Explora! I'd be happy to Todd, if you'll forward it back to me. Thanks! I sent it back via email. Thanks again, Joshua! I found this compilation of tips very helpful! It boils down to having this type of discussion with the couple from day one to determine their wishes, get it in writing and then fly with it! Informing the guests ahead of time is a must. Thank you for putting this together. Glad to hear that you found these tips helpful Lee. Thanks so much for reading Explora!